Dove Thermal Engineering provides consult-design-construct services and forensic support in energy-related topics. 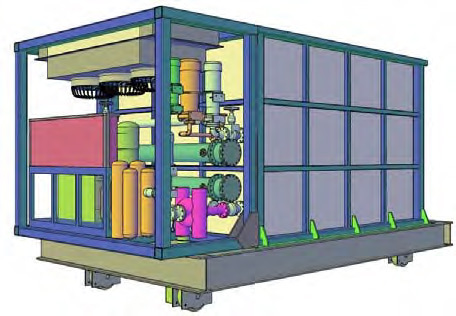 Good design of any cooling system starts with a clear understanding of the host operation and its behaviour. Effective interfacing of a variable load or batch-continuous operation with its cooling equipment is necessary to ensure that the rejection stage runs at maximum efficiency over the full duration of the production cycle. A well-designed system responds organically to imposed loads, with minimal recourse to automated control devices. The boundary layer at the surface of a water film or droplet is saturated with low pressure steam whose pressure is a direct function of its bulk temperature. Any pressure difference causes mass to be transferred and expansion to occur, so that energy is absorbed by the atmospheric moisture and lost by the free water. Open evaporative cooling towers and adiabatic coolers both work on this principle. Airblast radiators (dry coolers) are inherently safer and simpler to operate, although evaporative equipment cools to lower temperatures and absorbs less power. For very many years, we have consulted in process cooling as expert witness, forensic investigators, system designers and product development engineers. A quenchant is selected for according to required start-and-finish material qualities, which are largely determined by its behaviour in the boundary layer above-and-below saturation temperature. Dove Thermal’s expertise in the design of processes and equipment for thermal fluid heating, and in the specification of heat transfer fluids, cross-links with designing for their behaviour in metallurgical quench cooling operations. Our free-standing polymer quench cooling tanks incorporate refrigeration equipment for rapid and accurate tempering of the quenchant. Design features enhance preservation of fluid properties and enable close control of sludge handling. Dove Thermal has developed a family of process models for fluid temperature distribution in quench tanks to optimize a different types of product cooling operations. This Link provides information on our air impingement and controlled-atmosphere tunnels for product drying, cooling and finishing.